I assume that you love to get a six pack or flat abdomen. But even if you do not care about abs, you should be doing ab exercises. Ab muscles along with the back muscles form the core muscle group which are crucial in almost all upper and lower body lifts. Strong abdominals help you lift shoulder press and other upper body exercise more and stabilize your torso in squats and deadlifts. These are, as you know, power exercises designed to give you the best body ever. Lastly who does not like to have atoned, six pack ab to show off on the beach? With that said I will show you few cool ab exercises. Do them on non-workout days or at the end of your workouts. I will show how to the 4 best abdominal exercises - crunches, reverse crunches, side bends with dumbbells, and hanging leg raises and also show you extra 10 new abdominal exercises you might have never tried. Finally I will reveal you a two step formula for perfect six packs and even show you one six pack abs program you can try today. These will be the foundation exercise for your abs workout. Emphasis on upper abs. If you are serious about building and conditioning the muscles of your abdomen, the crunch is one of the long standing exercises that have proved to be effective in this domain. Learning to do the correct form is very useful as you will not be getting the maximum effect on your abdominal muscles if you don’t follow the correct form. You start the exercise by lying flat on the ground or bench and making sure that your legs are raised by placing them on a raised support or on a bench if available. Raise your upper body off the floor or bench, making sure that your lower back remains in contact with the floor at all times. This ensures that the force of motion comes from your abdominal muscles. Bring yourself back slowly to the starting position and the repeat. You can make the exercise more difficult by using weights, and also by using an incline bench instead of a flat bench. These are a variation from Basic crunches but very effective. Emphasis on Lower abs. 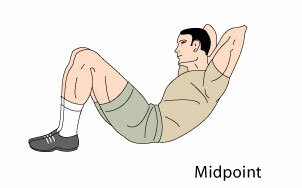 Reverse crunches are essential in order that you give your abdominal muscles a complete work out. While the normal crunch works the upper abdominal muscles, the reverse crunch works on the lower abdominal muscles. 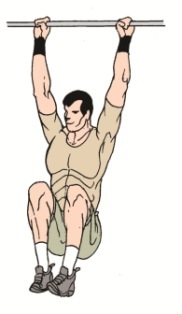 Here is the basic technique for performing the exercise effectively. Start the exercise by lying flat on your back, with your head on the floor and your arms behind your neck. Raise your feet to the air, keeping your knees slightly bent and then crossing your feet at the ankles. These create tension in the body to that the slightest move will affect the abdominal muscles. Lift your hips off the floor, keeping your back as straight as possible on the floor, hold at the top position, squeeze in your abdominal muscles for added effect, and then lower your hips back to the floor. They works on the lateral oblique muscles as discussed. The side bends are exercises that are targeted to the oblique muscles that are found of both sides of the body, running from the chest to the hips. Developing them will add the strength and overall appeal to a good set of abs. Side bends are usually performed using a dumbbell, and are done one side after the other. Hold a dumbbell in one of your hands and stand with your feet shoulder width apart. Keep your hands close to your sides. Bend at the side opposite to the hand holding the dumbbell, sliding your hands over your body as you do so. You should feel a stretch in the oblique muscles as your hand approaches the knees in the direction of the slide. Stop at the lowest point you can go and reverse the slide, going to the side of the dumbbell. After several repetitions, stop, change the hands holding the dumbbells and repeat the exercise sequence. This exercise can be done almost everywhere you can hand freely from. These include Tree branches; pull up bars and using ab straps. It is used to work the muscles of the abdomen, especially the hip flexors. Using an overhand grip (that is with the hangs holding the pole (or branch) from above rather than from below) with the hands spread out a bit wider than the shoulders, and your legs pointing down, with your toes pointing to the ground. Slowly raise your feet up, bringing your knees to chest level or higher with the toes still pointing down. Hold at the highest position lower your feet back to the starting point and then repeat. There are two different variations of the cable crunch exercise. The first one is the kneeling cable crunch, and the second one is the standing cable crunch. They are all used to work the abdominal muscles. This is done using the high cable pulley machines. Start by arranging the required weight needed on the pulley, and then holding the cable tightly with both hands, kneel below the rope. 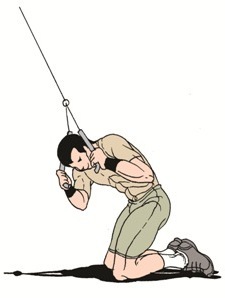 The weight of the pulley should be slightly raised so that the cable should be in tension at the start of your exercise. Then bend from so that your elbows that were pointing forwards at the start of the exercise come against the knees. Make sure that you use the muscles of the stomach in the process. Stop at the end of the movement, slowly lift yourself to starting position and repeat. With this exercise, you use a flat surface for support so that your back is kept straight and you only deviate from this support in your exercise. Placing the support in front of a cable machine, lean against the support with your back flat on it and your knees slightly bent. Bring the cables over your shoulders and hold with both hands with your elbows pointing downwards. Make sure that the cable is in tension at the starting position. Then bend forwards, with your waist still at the support so that only your abdominal muscles are moving in the process. At the furthest point stop, bring yourself slowly up and then repeat the process. There are many programs online which promises a lot but deliver nothing. Low carbs, high carbs, no protein to all protein, only crunches to no crunches! Is getting slim and fit so difficult? 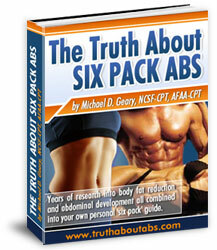 In this confused world I found Truth about Abs a wonderful program. Many people have found this program to be the final answer. I highly suggest you use the tips the programs discusses. Abdominal Exercises have been researched a lot and we now have the best Ab exercises ever developed. Why not use them to get a beach physique? Before I give you list of best Abdominal Exercises again lets talk about Shredded Abs. They're certainly in high demand. Lets face it. Building 6 pack abs may well be the toughest goal there is in fitness. But the reward is ooh! so worth it. Abs are the center point of the body, so if someone has poor abs either in quality or quantity, then it's noticed immediately. As soon as summer grips up people run frantically to get 6 pack abs. Stronger, firmer abs are a delight to look and feel. Here I will show you how to build them so that they pop out from a mile. A big mistake many people and even bodybuilders make is that they skip abdominal exercise training. I remember my gym trainer suggesting a thin guy to forget abs as he is too thin. This trainer obviously thinks ab exercises reduce body fat. No wonder many people who should be on the treadmill are seen on ab machines. What a shame. There are 2 steps to get sculpted abs. Shed excess body fat to make them visible. In step one I will show you the best abdominal exercises to build rock hard abs. In step two I will show you how to reduce the excess body fat that makes all the hard work hide behind it. You do not need the latest ab machine used by some gizmo guy as seen on TV. Proper diet and rest to ensure those gym trips are not a waste. The basic function of the abdominal muscles is to pull the rib cage and pelvis together. This movement is called "Crunching". Remember all kinds of Abdominal Exercises are some kind of crunch. Our main goal here is to build the front abs - the rectus muscles. The lateral abs - oblique muscles are stabilizers and will respond more to other exercises which I will discuss later. If you have never worked abs before then I highly suggest that you first build them with the king of Abdominal exercises - crunches. I will show you how to perform crunches and reverse crunches. These are the 2 mass builders. We will worry about toning later. Been working on abs? Got some results but not much to show off? Well Twisting Crunches, Leg trucks, twists are for you. So you want to compete? Have you ever seen a bodybuilder with ill-developed abs? Well not the best ones at least. Competitive trainers should work abs with high intensity and also include weak point training if necessary. This is a constant source of debate in the Abdominal Training world and no 2 experts agree. In the basic abdominal movement called the crunch the hip flexors activity limits and some say to certain extent eliminates the full effect on abdominal muscles. Proper Body positioning is very important in Abdominal Training as any crunching movement beyond 30 degree involves psoas muscles and increases the chances of back injury. But if you follow the exercise techniques mentioned here you will have nothing to worry. Also check the Core Exercises and Workouts for a complete Lower Back Strength and stability. Although in the Weight Training Workouts section I have included sample workouts here I will show you intense Abdominal workout samples routines. Check the Sample Abdominal Exercises and Workouts Section to pick an ab workout best for you. Abdominal exercises will by themselves never create a visible washboard abs unless you have a very fast metabolism. As Anthony Ellis says "Abs are made in the Kitchen, not in the gym". You may have build Ab muscles but with a layer of fat around your stomach, they will remain invisible. Losing the excess body fat is very doable but does require aerobic exercises. Check the Weight Loss Exercises Section and learn the short intense Aerobic exercises. You do require a sound nutritional program to complement your efforts in the gym. Check the Diet Centre for more information. Flat Stomach Exercises - Want to lose stomach fat? Then I suggest you visit Lisa's Website. Don't forget to read her article on How to get rid of Love Handles. Whats' your favorite Abdominal Exercise? If you have a new abdominal training tip, your favorite exercise or simply a new workout which you have found useful, please share it here and get famous. 1. Any exercise for abdominal muscles with dumbbells? Yes, there are several. The most common would be side bends while holding dumbbells in your hands. You could also perform traditional situps while holding dumbbells in your hands as your arms cross your chest. 2. Do abdominal exercise machines work? Basically, abdominal exercise machines add stress and weight to the motion of the ab exercises your perform. Since the ab muscles must carry the weight of the machine, they muscles will grow stronger and more ripped. 3. How often should you exercise abdominal muscles? The ab muscles can be resistant to exercise since they contract constantly on a daily basis. So, you need to perform exercises on the abs at least four times a week at 20 minutes a session. 10 minutes a day six days a week is another mode to follow. 4. Instructions on how to use the professional abs abdominal exercise fitness machine gym workout? Add a moderate amount of weight to the cables. Don't make the drastic error of overdoing it with the weight or else you run the risk of an injury. Perform the ab crunch motion and hold the position for one second before returning to the starting position. Light weights with high reps would be the common way most people perform these types of ab exercises. 5. What is the first exercise is abdominal strengthening and pelvic stability? It could be said the basic abdominal crunch does this since it properly and effectively hits the entire core of the body. That means the abdominal muscles are worked out and so is the lower back, pevic region, and various other core muscles. 6. What exercise can i do with a abdominal hernia? None. Exercising with a hernia could make the problem worse. Consult with your physician prior to starting any exercise programs when you suffer from a hernia. 7. What's the best abdominal exercise after a hysterectomy? One exercise would not be any better than the other. You would need a well rounded exercise program that hits all the ab muscles. That said, you need to wait until the surgery has been completely healed and your doctor gives you the okay to exercise again. The injury you could suffer exercising too soon after the surgery could prove disastrous. Check the ab exercises for women for more. 8. When to do ab exercise after lipo? You need to wait until your surgery has been completely healed. To perform any abdominal exercises prior to the procedure being healed could have extremely serious negative consequences. Ask your physician what would be the proper amount of time to wait prior to commencing ab exercises after liposuction. 9. Does the ab circle exercise equipment work? Yes it does. Some fitness fans will mention they do not see much value in this device but it really is not bad. The problem is that the marketing campaign overstates its value. The key here is that you need to combine the device with a comprehensive abdominal workout program that leads to overall results. 10. Who sold the ab and back exercise machine? Quite a few companies sold devices of this nature with the two most popular being Body Gold and Body Solid. Of course, each manufacturer produced more than one machine produced in their product lines. 11. Is a exercise ball effective for an ab workout? The traditional medicine ball can be used for all manner of abdominal exercises. You might even be surprised at the sheer number of ab exercises you can perform with a medicine ball. A smaller ball that bounces dubbed the plyoball can be equally effective. 12. What ab exercise machine works best? A seated crunch machine that is connected to free weights as opposed to hydraulic cables would be among the best to employ. Without a doubt, this particular workout machine hits the abs to a level like no other device. 13. What exercise burns the most ab fat? High intensity interval training that involves jogging for 30 seconds followed by sprinting for 30 seconds for the duration of your choosing would melt away a ton of ab fat. Just be sure to warm up and cool down properly with this exercise. Running can also be substituted by other cardio workouts. The key is that they are performed with high intensity interval training. 14. What helps with ab exercise? More than anything else, you want a good diet that reduces your calorie intake. No one will see your abs if they are covered in fat. That is why you need to do what you have to do to get your diet under control. Nothing undermines an ab workout program like a bad diet and nothing helps it more than a quality diet. 15. What is the vacuum ab exercise? This can be considered a lost abdominal isometric exercise that can seriously enhance the development of the abs. Inhale until your lungs are full. Exhale until your belly buttons converges on the spine. Hold for 5 - 10 seconds. That would be one rep of this exercise. 16. How long would it take to get abs with an exercise ball? You already have abs. You just want them to show! In all seriousness, the amount of time it will take for the exercise ball to turn your stomach into a six pack depends on your current level of body fat. Generally, you will need to get down to lower than 10% body fat for the abs to become clearly visible. 17. What if you have no abs will the flex belt work with out exercise? You always have abs. You have six of them. They just are not visible either because you have too much fat in the stomach region or you are skinny but do not abdominal workouts. The flex belt will work the abs and help develop them quite significantly. The key is that you mix in cardio work, a proper diet, and a complete exercise program. 18. Should you exercise abs every day? Unlike other muscle groups, you can work the ab muscles each and every day. However, you do not have to work them out every day. A minimum of 4 days a week is required since the abdominal muscles are always contracting. Working them out every day is possible but you need to avoid working them on days where you are sore. Don't overdo it or you may end up with an injury. 19. How to exercise lower abs? You need to employ exercises that target the lower abdominal region. Leg raises and leg lifts would fall into this category. 20. What is the best exercise machine for sculpted abs? A crunch machine. This device incorporates a chair that is connected to a cable and weight bars would be the best of these types of machines. Such a device can employ any manner of weight you would prefer to utilize which allows you to devise the proper intensity level for your needs. 21. What is the best exercise for your lower abs? Legs lifts/raises and leg presses work the lower abs to a great degree. Both of these exercises are performed while lying on your back on the floor which leads to the stress shifting to the lower abdominal region. 22. Any ab workout for those that have lower back problems? This is something that needs to be addressed with a chiropractor or medical professional. However, is safe to say a proper diet will lower body fat which can make the abs visible. When you have injuries, you really need to discuss your approach to exercise with a physician. 23. Is running a good ab workout? Running can be an excellent workout for the abs because it can tremendously reduce body fat levels which will make the abs visible. Also, the stress on the abs from is enough to slightly develop the actual muscles in the abs. You could say that running is among the most overlooked of ab workout exercises. Don't make such an oversight! 24. How often ab workout? 3 - 4 days a week for about 20 minutes a day will be required in order to see decent results with ab exercises. You also need to eat a good diet 7 days a week or your abs will never be visible. 25. Is an exercise ball effective for a ab workout? Exercise balls of all variety have been employed for many, many years so it is safe to say they are highly effective. In fact, exercise balls can be used to strengthen all the core muscles and do so quite effectively. 26. Is an ab roller a good workout? The ab roller can prove to be a tremendous device to enhance and boost and abdominal workout program. This is not an easy device to workout with which means you may need to take a little bit of time to get used to it. However, the end result will make all the effort worth it. 27. Is protein good to eat after an ab workout? Protein is extremely helpful because it helps repair the muscle tissue. It also helps maintain muscle tissue which aids in keeping the metabolism revved so people can see your abs. 28. Anyone have the Workout Calendar for Hip Hop Abs? 29. Anyone have the Workout Schedule for Hip Hop Abs? 30. Any preview of Tami Lee Webb's Abs of Steel workout videos? Promotional video clips of Tami Lee Webb's Abs of Steel are available on YouTube. They provide excellent insight into what you will get when you order the DVDs. 31. How many minutes for abdominal workout per day? This can vary from person to person. Most people will perform a 20 minute ab workout per day although some may stretch to 30. That said, 10 minutes per day can might be enough. 32. Any instructions on how to use the professional abs abdominal exercise fitness machine gym workout? It depends on the machine. Machines that employ crunch exercises would follow the same strategy. Basically, you want to keep the weight loads low, the reps high, and hold your contractions when you are in a crunch position. It would be helpful to ask the gym staff if you are performing the exercises properly. Read more about Abdominal Exercises Equipment and Machines.